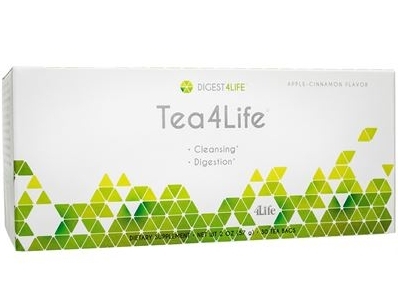 4Life Tea4Life® - Delicious Cleansing Tea at best discounted price! 4Life has created a distinct and delicious herbal tea specifically formulated to ensure internal health and balance. Cleansing the gastrointestinal tract is very important. This cleansing process helps our bodies break down and utilize our foods more efficiently, helps improve nutrient absorption and helps bring our bodies into balance. Try Tea4Life today and you'll notice the difference—more energy, more effective weight management and a stronger immune system. I was feeling very tired and had no energy. After being tested with "biofeedback", I was informed that my body needed to cleanse. I am taking Tea4Life and Fiber4Life. Soon I will really be able to experience the full value of 4 Life's supplements. Recently I was an overweight, unhealthy and miserable person. Responding to a contest to lose weight, I tried Fiber System Plus, Phytolax, Tea4Life, exercised regularly and changed my eating habits for ten days. I was able to maintain a healthy weight.